May is in the books! 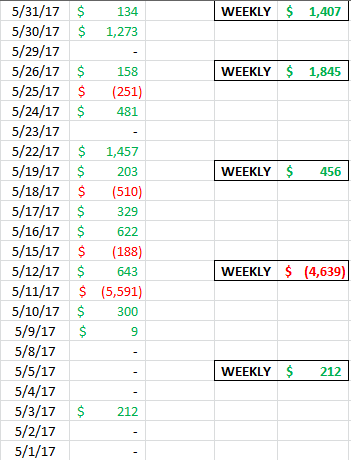 I am closing May with a small loss of -$719. This month has not been easy. I know that there have been many traders that have felt the same. For me, however, my niche setups just were not there in abundance. I had a hard time finding plays to size into. I frequently was stopped out at breakeven on trades. Things were very choppy and many days with poor volume. I just could not get any big wins. 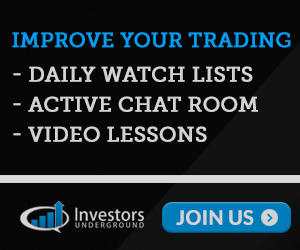 I missed a chunk of the beginning of the month due to some account changes I made and I was working at getting used to a new platform–Sterling Trader. It was a frustrating and discouraging month for me. This is not a complaint, it’s just the reality of what I personally faced this month. This month was also a reminder of how important it is not to get stubborn on taking losses. I had one stubborn trade this month that resulted in a +5K loss. 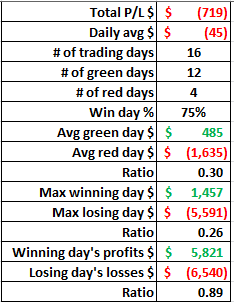 If I would have stopped out at my max loss, or even my max daily loss, I would be ending this month about +3K in the green. It’s SO important to respect stop losses and trading rules. I hate that I am still in a place where I need to be reminded about that, but I am, and I guess we all are at times. I am looking at ways to better manage my risk with sizing in. One of those things is how I scale into parabolics–a setup that I love. I can be quick at times to scale, but I want to start working on slowing that down and waiting until stuffing action is noted. This will give me more room, which is important on these types of plays. I can then hammer in with size on back side confirmation. I also want to work more on starting in with better size relative to my set risk, instead of just a one size fits all approach. For example, if the risk on XYZ play is just .05 I can start in with much more size then if the risk was .5. I am also working on how to add in some long plays. This is a hard one for me. I struggle with changing my short bias, but I recognize the potential if I can do so. I am excited for a fresh new month. I can’t wait to continue working on my craft!